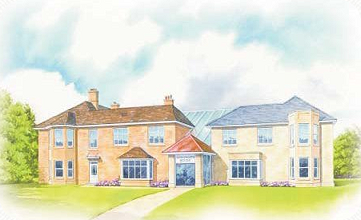 Our main clinical psychology offices are located at Brinkworth House, in the village of Brinkworth, a few miles west of Swindon. We are situated on the B4042 between Junction 16 (Wootton Bassett) of the M4 and Malmesbury. Brinkworth House is opposite the Golf Club on the Malmesbury side of the village. Travelling from the East, we are on the left, about a mile after the 'Three Crowns' pub. Travelling from the West, we are on the right, about a mile after the Brinkworth village sign. Brinkworth House shares it's entrance with the Walled Garden Nursery, so you can also look out for their sign. We are easily accessible from the North Wiltshire towns of Swindon, Malmesbury, Wootton Bassett, Calne, Chippenham, Corsham, Melksham, Devizes, Cricklade and Marlborough. It is also a short journey from the south Gloucestershire towns of Tetbury, Lechlade, Fairford and Cirencester; Oxfordshire towns such as Faringdon and Wantage; and from west Berkshire towns near Hungerford. If you are travelling using SatNav, the postcode is SN15 5DF. Alternatively, click here for a map and directions from wherever you are.